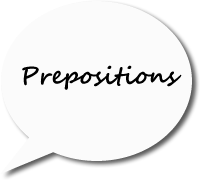 Grammar Lessons - Prepositions of Time. The following table includes the prepositions of time in English. This is the first cigarette I've had in three years. There's a meeting at 2.30 this afternoon / at lunch time. I'm just going to bed for an hour or so. She's always up before dawn. She had promised to be back by five o'clock.